Stop me if you’ve heard this before – there are relocation rumors surrounding a professional sports franchise in Phoenix, Arizona. However, for the first time in quite a while, it isn’t the Arizona Coyotes in the national spotlight (who announced on Thursday that they’ll be staying in Gila River Arena until at least 2020, by the way) – it’s the Phoenix Suns. The City of Phoenix recently postponed a vote on a potential agreement to renovate Talking Stick Resort Arena, the 26-year-old home of Arizona’s NBA team. Suns owner Robert Sarver responded by “allegedly” threatening to move his franchise to Seattle or Las Vegas, a move that was universally criticized by both sports fans as well as the general public in the state. The Suns have been in the Valley of the Sun since 1968 – until the Arizona Cardinals moved here in 1988, the Suns were the only show in town. They’re the only team in Arizona that boasts more than two generations of fans, and, before the recent nine-year playoff drought under Sarver’s ownership, the franchise was one of the NBA’s premier clubs and free agent destinations. Sarver, for lack of a better word, has destroyed the Suns. He’s gone cheap on most of his recent personnel decisions and the result on the court has been obvious. The State of Arizona hasn’t seen an NBA playoff game since May 29, 2010 – exactly 3,131 days ago as of today, December 24, 2018. That’s a lot of terrible basketball we’ve been forced to endure under Sarver’s watch, and it’s safe to say his threat wasn’t well-received in Arizona. Ms. Rogers speaks for all of Phoenix when it comes to our feelings toward Sarver. He isn’t a popular man right now, and he might want to reconsider his stance toward sharing an arena with the Coyotes, something he’s been hesitant to do in the past. Put simply the Suns and Coyotes must work together on getting a new multipurpose arena built in Downtown Phoenix. There’s no other way this will work – it’s become abundantly clear that there is no appetite by city and local officials to build a new arena specifically for the Coyotes, and it was made clear by the postponement of the vote that support among both lawmakers and the public for renovating the Suns’ arena is lukewarm, at best. In order for this situation to have a happy ending for everyone, there has to be cooperation between the two franchises – Sarver must compromise with the City of Phoenix, and must change his stance and agree to share a home with the Coyotes. The proposal being voted upon by the City of Phoenix on Jan. 23, 2019, is for a $230 million renovation to the existing structure already in place in Downtown Phoenix. It includes $80 million from the Suns along with $150 million from the City of Phoenix itself, which, contrary to popular belief, comes from the Sports Facilities Fund (generated by taxes levied on tourism such as hotel rooms and car rentals), and not the city’s general fund. Phoenix would pay for infrastructure repairs, while the Suns would be responsible for paying for other enhancements to the arena’s appearance and fan experience. However, as a Phoenix resident who has been to over 100 events in that arena, from concerts and basketball games to arena football contests and WWE matches, I firmly believe that a renovation would not fix the problems it currently has. The building opened in 1992, and obviously is extremely dated compared to arenas which have opened in other cities in recent years. Renovations have been performed in the past to improve the arena’s appearance and fan experience, but it either needs a complete rebuild (a la Seattle’s KeyArena), or needs to be imploded with a new arena rebuilt on the site. The current arena’s problems are numerous – the upper concourse is so narrow that fans can’t stand in line for concessions without blocking the walkway for others who are trying to get from A to B. The seating above the fifth row in the upper level is so cramped that I’ve elected to stay home in the past rather than pay an extra $100 to sit downstairs. It’s a good thing no one supports the Suns these days, because the fan experience would be absolutely miserable if every seat was filled. Additionally, the sightlines in the arena are terrible for anything other than basketball. The venue was designed to provide an intimate experience for basketball, which it does, but the arena’s seating bowl isn’t designed with other events in mind. The Coyotes used to play in the arena before moving to Glendale in 2003, and, while the building provided an unbelievable atmosphere for hockey (as seen below), there were approximately 8,000 seats which offered a limited view of the ice. Even for concerts, about a third of the arena’s seats are either to the side of or behind the stage. For events like the WWE, the arena’s roof doesn’t rise high enough to allow an unobstructed view from the upper level – apparatus like lights, speakers, and signs blocked the view of both the ring and the videoboard when I attended the WWE’s Elimination Chamber event in February of 2017. A $230 million renovation might fix some of the problems present in this building, but there’s only so much that can be done with the existing structure, which is too small for current needs. Following the proposed renovations, the Suns would be expected to stay in the arena until 2037, at which point it would be a 45-year-old building – unheard of by today’s standards. Instead of wasting money on renovating a building which will soon turn 30 years old, the City of Phoenix, the Suns, and the Coyotes would be better served to explore building a new arena in downtown Phoenix which can support a variety of sports and entertainment events. Sure, there’s the added cost of the demolition and cleanup, which could cost between $10 and $20 million, as well as the extra money required to build from scratch, but a new arena is the best option in the long run, and isn’t as expensive as one would be led to believe. T-Mobile Arena in Las Vegas, Nevada, was constructed from May 2014 to April 2016 and cost $375 million to build – I was there for Opening Night back on Oct. 10, 2017 – it’s a state-of-the-art building and is something Phoenix officials should base their design around. The Grand Opening of T-Mobile Arena in Las Vegas, April 6, 2016. 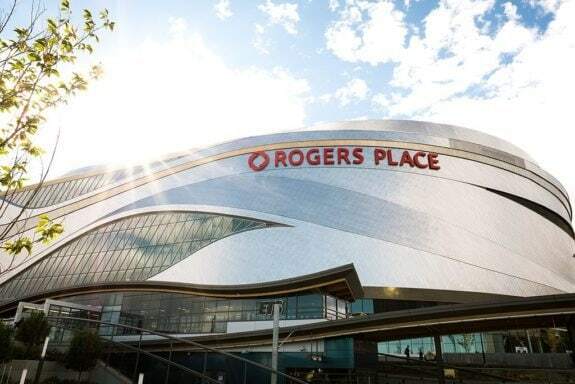 Edmonton’s Rogers Place, the new home of the Oilers, opened in September 2016 and cost $480 million CAD to build. In US Dollars, this comes out to $353 million – slightly less than what it took to build T-Mobile. While I haven’t yet visited the new arena in Alberta, everything I’ve heard from others indicates that it’s also an outstanding venue. 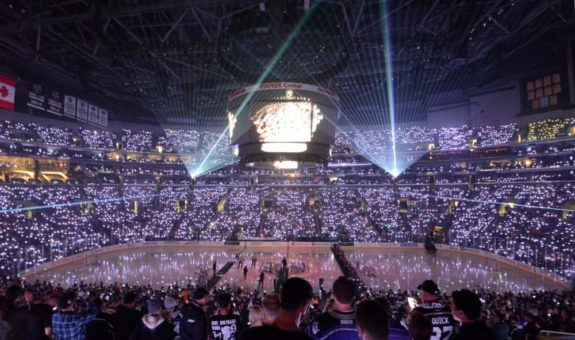 Even the Staples Center in Los Angeles, which will soon turn 20 years old, would be a great venue to draw inspiration from – the arena is huge on the inside, with great sightlines and adequate space for fans in both the upper and lower-level concourses and seating areas. It’s aged extremely well for an arena which opened in 1999. Adjusted for inflation, Staples cost $552 million to build – remove two of the arena’s three luxury suite levels, which Phoenix doesn’t need, and that price tag drops significantly. Two other venues I’ve also visited, the Bell Centre in Montreal and Scotiabank Arena (formally known as the Air Canada Centre) in Toronto, also have stood the test of time. The Bell Centre, built in 1996, was constructed for the inflation-adjusted equivalent of $291 million USD, while Scotiabank Arena was built for ~$273 million USD in 1999. With all that said, if the Suns, Coyotes, and the City of Phoenix are committed to providing the best long-term solution to the ongoing arena drama involving all three parties, the construction of a new multipurpose arena on the footprint of Talking Stick Resort Arena is by far the best option there is. Unlike football stadiums, which can run cities and teams anywhere from $900 million to $5 billion, arenas are significantly cheaper and require less time to construct. Phoenix doesn’t need anything revolutionary or unique like Detroit’s Little Caesars Arena, which cost $862.9 million – the city just needs a new building with more space and modern amenities which can support a hockey team without embarrassing “features” like obstructed view seats or a scoreboard that hangs over one of the bluelines instead of over center ice, which were present at Talking Stick Resort Arena in the early days of the franchise’s tenure in Arizona, and are now present in the New York Islanders’ home rink, the Barclays Center. The Suns and the City of Phoenix are already offering to pay for a renovation – the Coyotes need to step in and join the project as they continue their search for a new, centrally located arena in Phoenix, especially once their sale to a new owner becomes official. If they truly are committed to staying in Arizona, they need to realize that a new downtown arena is likely their only chance at getting a new home in the foreseeable future. After allegedly threatening to move the Suns to Seattle or Las Vegas if he didn’t get his way, Sarver is now attempting to make amends with a city of fans who, if they didn’t already dislike the man beforehand, now really don’t like him. He had team CEO Jason Rowley make the media rounds in the days following the threat, and released a video to social media saying he’s committed to staying in Downtown Phoenix. Sarver can say and do whatever he wants after the fact, but he’s desperately in need of some good PR after threatening to move Arizona’s oldest professional sports franchise, and a great way to regain some of his standing in the Valley would be to agree to share any new or renovated arena with the Coyotes. Sarver reportedly has been hesitant to agree on sharing Talking Stick Resort Arena with the Coyotes in the past, but there’s absolutely no good reason as to why this shouldn’t occur – 10 of 24 American NHL teams share an arena with an NBA franchise, while the only Canadian city with an NBA franchise – Toronto – houses both the Raptors and Maple Leafs at Scotiabank Arena. The Staples Center in Los Angeles is home to two NBA franchises as well as the Kings – that’s 123 event nights from October to early April from hockey and basketball alone, and arena officials make it work, along with a busy concert and event schedule as well. If Sarver’s lack of cooperation causes the Coyotes to relocate, he might as well relocate along with them. He’s already universally disliked among Suns fans – if he’s not careful, another section of Valley residents will turn against him as well. To the City of Phoenix – building a new downtown arena is not just a good solution, it should be the only solution. A renovation will not fix anything and we’ll likely be back in this spot again inside of 10 years as Talking Stick Resort Arena continues to get more and more outdated. You already renovated the arena in 2003 – 11 years after it opened. That should tell you something – it’s been an insufficient venue for a long time already. It’s time for a replacement, and it’s time for you to step up to the plate and take your best swing. Strike out, and you lose not just one, but likely two professional sports teams, along with Phoenix’s status as one of just 13 cities with teams from each of the four major North American professional sports leagues. To the taxpayers of Arizona – rest easy. Money for any arena project is coming from the Suns and/or the Coyotes, and from a fund that draws revenue from taxes on rental cars and hotel rooms – a tax that many of us don’t pay unless we’re staycationing or going on a road trip. Schools, roads, and social programs aren’t being affected by any arena proposal. You’ll need to do a whole lot more reaearch than you have done.